» News » Corporate news » Come Visit Tradecorp at Expo AgroAlimentaria in Mexico! Come Visit Tradecorp at Expo AgroAlimentaria in Mexico! 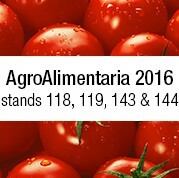 Tradecorp will be present once again at Mexico’s most important agribusiness exhibition, the Expo AgroAlimentaria. This event will be held in Irapuato, Mexico from November 8th to 11th, at which agricultural professionals from more than 15 countries will come together with the goal of doing business and learning about the latest in agricultural products. Tradecorp would like to invite you to stop by our stand at the exposition, where our professionals will gladly share their tips on how to maximize crop performance. You can also learn about Tradecorp products specific to the Mexican market. Come visit us at stands 118, 119, 143, and 144!